COFFEE addicts will be spoiled for choice when a brand new cafe opens its doors in two weeks time. Queensland's first Everfresh Market cafe will be serving its first cuppas to customers as soon next month. The revelation comes just weeks after the grocery store announced it would be rolling into the Rum City as part of a $1.1 million revamp and rebrand of the Cornetts Supa IGA on Woongarra St.
"We're changing the approach to retail in Bundaberg," Cornetts Supermarkets CEO Graham Booyesen said. 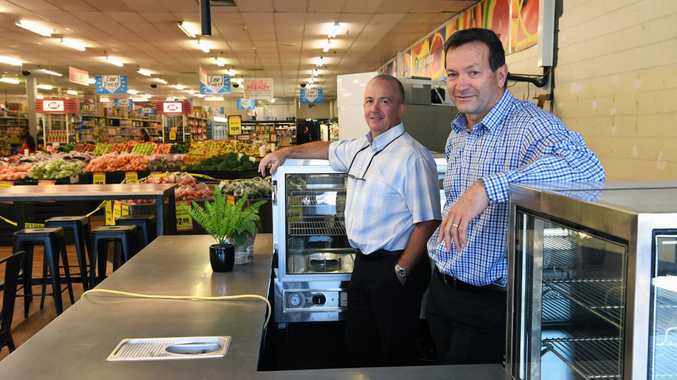 "It's not going to be an IGA any more - it's going to be Everfresh. It's going to be focussing on high-quality produce and high-quality meat at value prices." Already under way, the million-dollar revamp will include new racking, floors, fridges and a paint job, with the goal behind the cash splash being an entirely new feel in store. Leading that charge is the brand's Merlo Coffee offer. "It's a bit of research and development for us," Mr Booyesen said. "We have seen a couple of supermarkets with coffee offers that the customers enjoy, so we open up at six o'clock in the morning so the customers are in here very, very early, and we just thought, coffee and a pie or coffee and a sandwich would go a long way of making their experience a lot better. "This is our first one, it's our experimental one. If it works well we'll certainly spread it out throughout the company." A few of the future cafe locations the CEO dropped included Port Douglas, Bucasia Beach at Mackay, Bribie Island, Oakey and Longreach. The Bundy Everfresh store is only the second of its name in Queensland, with the pilot having opened at Buderim last month. "Bundaberg Central was going to be the first one. It was the store we planned the whole concept around," Mr Booysen said. "Buderim ended up skipping the line, but Bundaberg was our plan from the beginning." The cafe will be accessible to both customers and passers-by, with one of the corner store's door's typically closed in the past set to be ajar from 6am each day. Standing room and a seating area will be available. Mr Booyesen said Everfresh was also in the process of sourcing cup holders, with the intention of attaching them to the supermarket's trolley to improve customer experience. He told the NewsMail the staff currently employed at the CBD Cornetts Supa IGA would continue working at the store, but under the new brand. "We've also employed two baristas ... but then what we want to do is take all our staff inside and train them as well, so multi-skill them to become baristas and then they'll have a different skill and can help out as well," Mr Booyesen said. Over the next few weeks, new cafe equipment, fridges, shelving, produce and organic, sugar-free and gluten-free products will arrive in store. "The customers are going to see some disruption to their shopping," Mr Booyesen said.